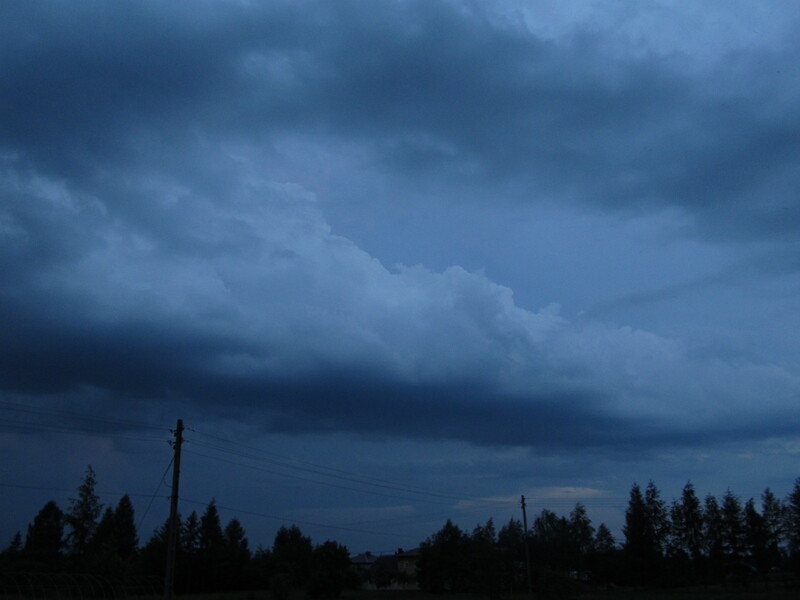 Cumulonimbus cloud sweeping above Odrzykoń as a perfect example of non selective light scattering. 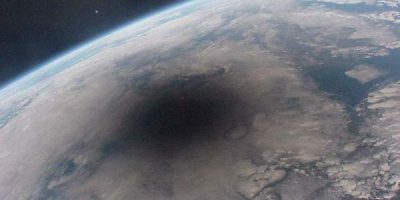 How the lunar shadow looks like during the solar eclipse? Previously I have described the light scattering mechanism on the smallest particles of the Earth’s atmosphere, where mainly the Rayleigh Scattering plays a role. Now is time to round off this whole article and say something more about a different group of elements, that also contributes in the light scattering process. There are a bigger particles that build the fog and clouds. As an output of this whole light scattering process in the Earth’s atmosphere we can see the interaction of these all small particles with the Earth’s surface – a ground response. Mie scattering take place when droplets and light waves are of similar size or these particles are bigger than the light wavelengths. This kind of scattering does not differentiate individual wavelength colors and therefore scatters all wavelength colors the same. The result is equally scattered initial light coming from the illumination source. In bigger droplets size the scattered light coming from inside cancel each other and what remains is interpreted as reflected and refracted waves. In this case the spectral composition of the scattered light depends of the scattering angle (Pic. 1). Pic. 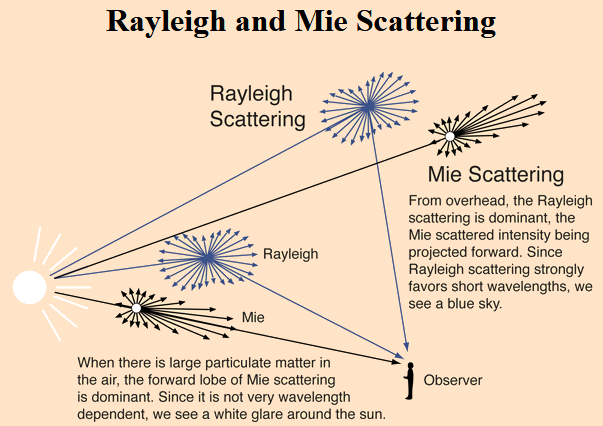 1 Angular distribution of scattered light comparison between Rayleigh and Mie scattering, whereas direction of incident light remains stable (http://hyperphysics.phy-astr.gsu.edu). Pic. 2 The Rayleigh and Mie scattering mechanism (http://hyperphysics.phy-astr.gsu.edu). The common particles causing the Mie scattering are: dust, pollen, smoke and microscopic water droplets, that form clouds. 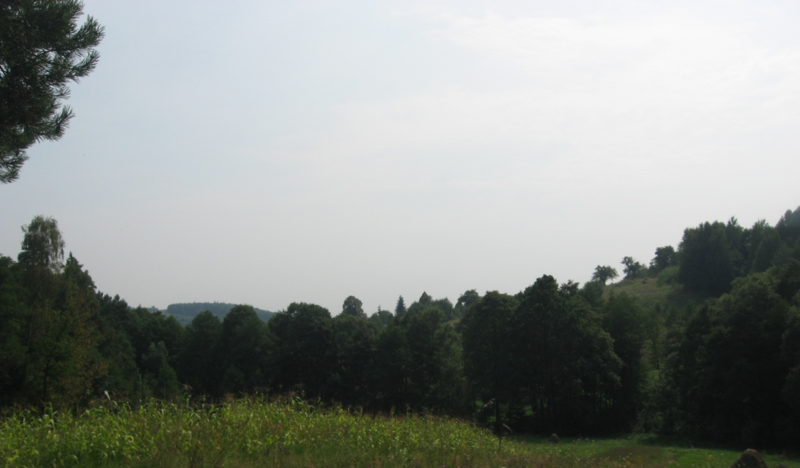 Mie scattering occurs mostly in troposphere, especially in atmospheric boundary layer, where often haze is observed. Pic. 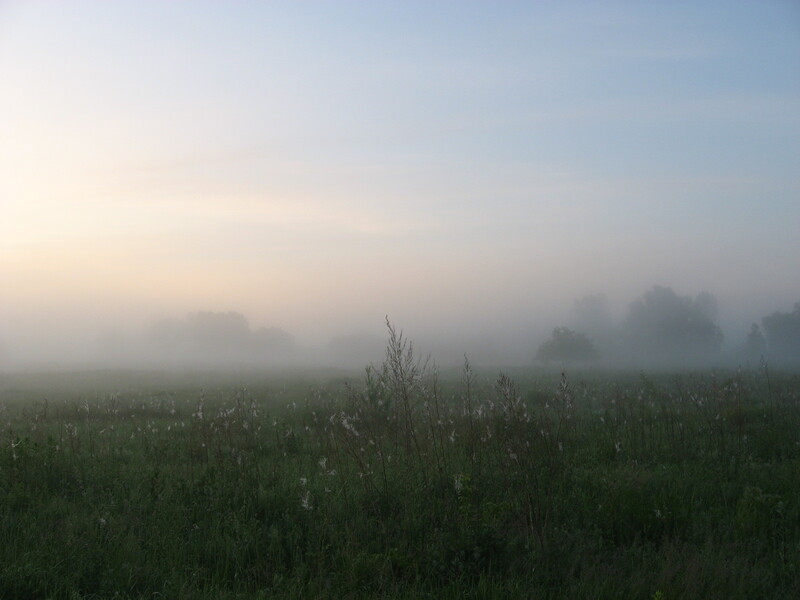 4 The Mie scattering for particles with size bigger than light wavelengths (fog). In the result the visibility range is restricted up to less than 1km. Odrzykoń, Poland. This kind of scattering is very important in meteorological optics with respect to many problems regarding haze and cloud scattering. 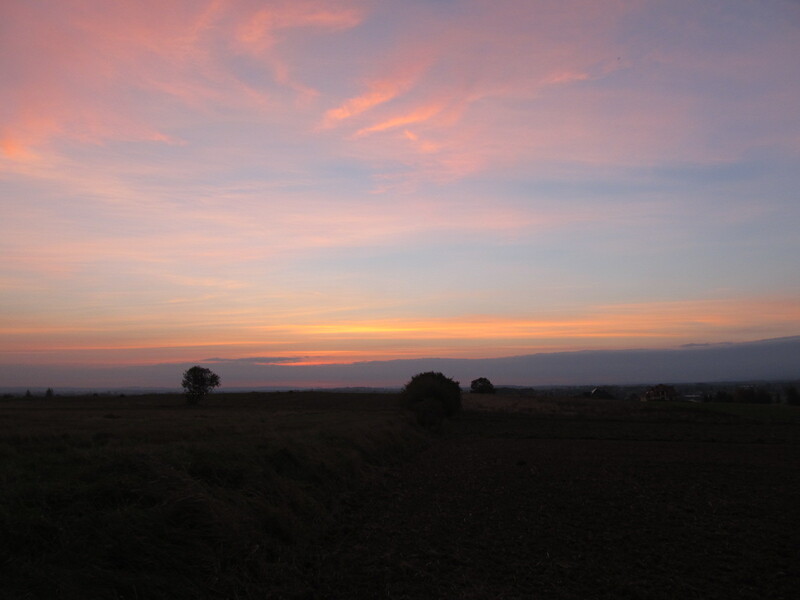 Mie scattering can change a hue of the sky. Whereas sky in near-Rayleigh conditions is deep blue, in Mie scattering conditions this color can be washed out depends on the big particles concentration in the atmosphere (Pic. 5 – 7). Pic. 5 The impact of mie scattering on the sky color (atmo.arizona.edu). Pic. 6 The sky colour difference depends on the big particles concentration in the atmosphere: left – in hazy conditions, right – in near-Rayleigh conditions. St. Michel’s Mound, UK (left); Zadar, Croatia (right). Pic. 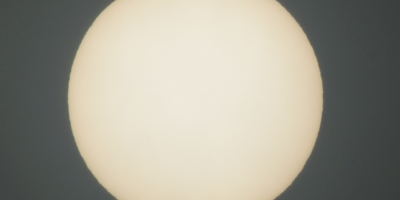 7 Extremely high haze concentration in the lower atmosphere makes sky white-bluish, especially when looking near solar direction. Łęki Strzyżowskie, Poland. Tyndal effect is similar both to Rayleigh Scattering and Mie Scattering. The similarity of Tyndall effect to Rayleigh Scattering lies in the same law, where the intensity of scattered light depends on the fourth power of the frequency. In the result blue light is scattered much more strongly than red light. This situation refers to particles in colloid or very fine suspension. Tyndall scattering is more intensive than Rayleigh scattering due to bigger size particles involved. If the colloid particles are spheriod then Tyndall effect can be analyzed in terms of the Mie scattering, which admits particle sizes in the rough vicinity of th wavelength of light. In Earth’s atmosphere it refers to weather conditions, where Tyndall Effect can be noticed in foggy or dusty place, which is a good colloid. A sunlight passing through this colloid encounters the individual suspended particles, which scatter and reflect light. These individual suspended particles like water droplets makes the headlight beam visible. The amount of scattering depends on the frequency of the light and density of the particles. When is no small particles in the air then is not possible to see a path of light, but when there are enough particles in the air you can see the path of light, that is reflected by them. We can observe it for example in mossy forest or dusty indoors (Pic. 8, 9). Pic. 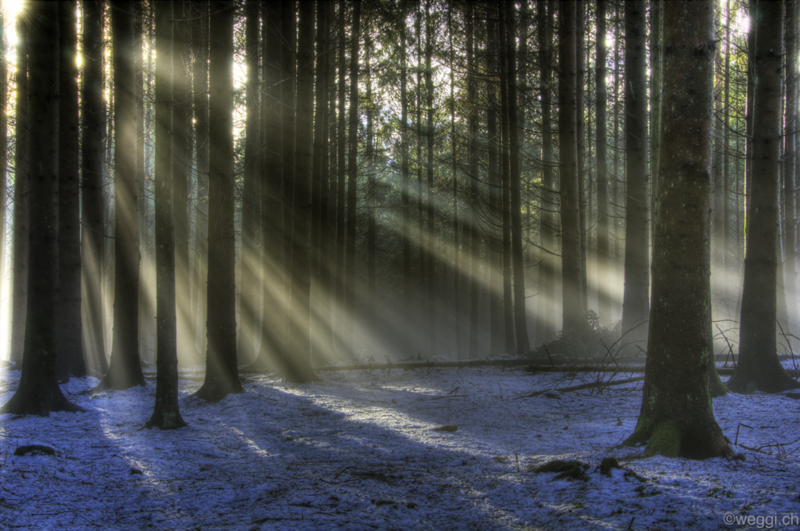 8 An example of Tyndall effect is to be seen in forest, when Sun shines through thin fog (weggi.ch). Pic. 9 An example of Tyndall Effect in indoor, where is caused by dust (Wikimedia.org, Pinterest.org). Non-selective scattering occurs in the lower portion of the atmosphere when the particles are much larger than light wavelengths. 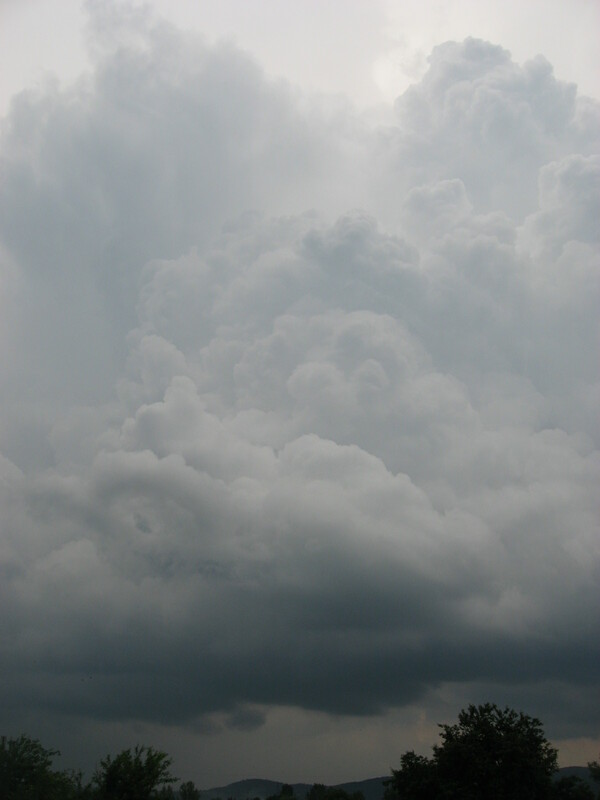 The non selective scattering creates a white appearance of sky and plays a main role in cloud formation. The presence of clouds on the sky creates the cloud cover, that says roughly how much the sky is affected by any kind of cloud (Pic.10) . In dense clouds this dependence is averaged out by varying drop sizes and multiple scattering and the clouds appears white or grey (Pic. 11). Cloud droplets scatter all wavelengths of visible light creating the appearance of white cloud. The main difference between non-selective scattering and others is the ability to reflect the light. The water droplets are much bigger from light wavelengths. Due to this non-selective scattering enables to reflect the light also unlike to Mie scattering and Rayleigh Scattering. Pic. 10 A polarity between non-selective scattering (white cloud) and Rayleigh scattering (blue sky). 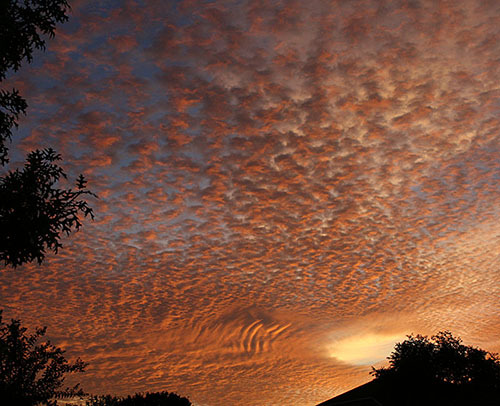 Big puffy cluds scatter light effectively making the sky around them much brighter (atmo.arizona.edu). White clouds cool Earth by reflecting some sunlight up into outer space and they warm it bouncing some sunlight down to the surface (Kassinov et all., 2011). Pic. 11 Cumulus humilis cloud on the blue sky is a good example of non-selective scattering in conjunciton with Rayleigh scattering. 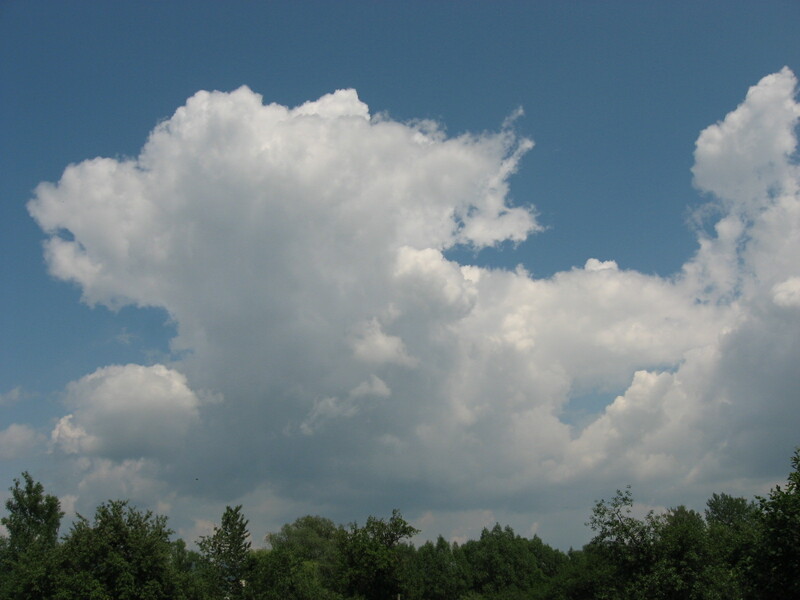 Most of cumulus clouds are dense, so they appears white and grey at once. Pic. 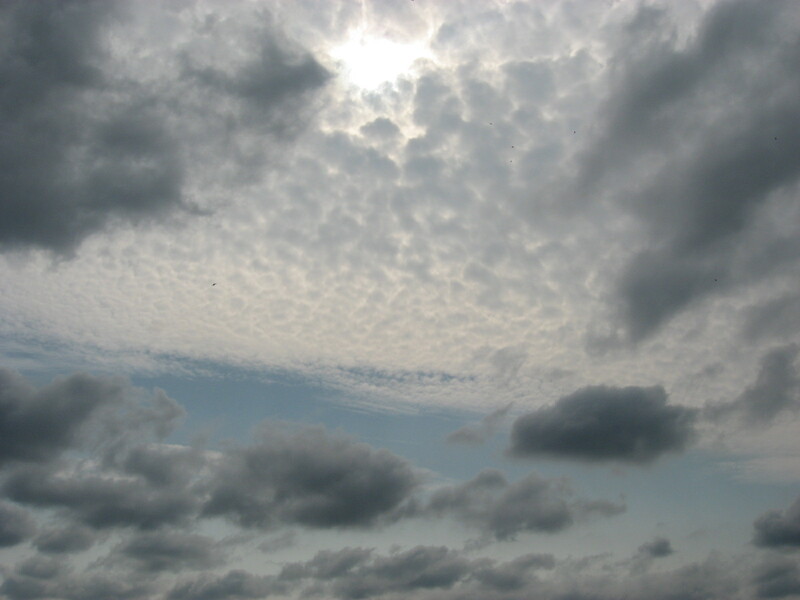 12 White altocumulus clouds under fair weather conditions, whereas cumulus below, shaded by altocumulus appears to be grey, even darker than grey altocumulus base. Pic. 13 The light scattering by clouds – scheme. 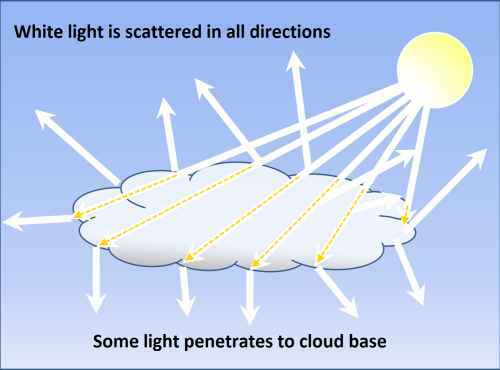 White light is scattered in all directions, some light penetrates to cloud base (weather.gov.hk). Pic. 14 Especialy in vertically developped clouds we can see very dark base. As the cloud grows thicker the more sunlight is reflected from it and less light can penetrate through it. Małe Pieniny Mts, Poland. Pic. 15 Relation of light scattering with cloud depth (weather.gov.hk). The cloud cover affect on the diffuse sky radiation. 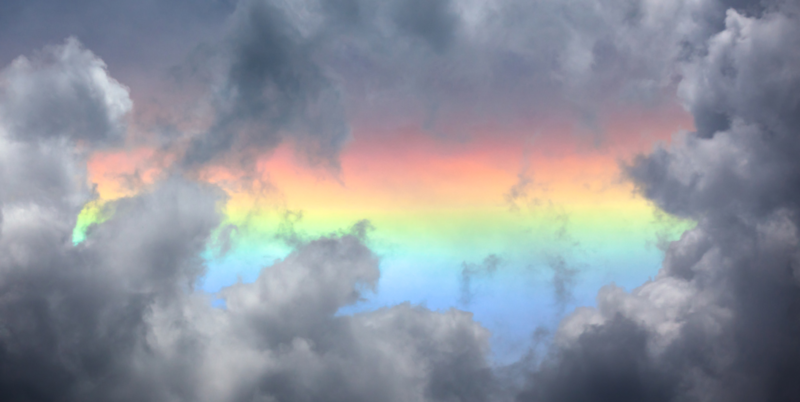 The flux of light is not wavelength dependant because of the fact, that cloud droplets are larger than the light’s wavelength and scatter all colours approximately equally (Pic. 16). Pic. 16 Under overcast sky a diffuse sky ratiation plays main role in light scattering. Odrzykoń, Poland. 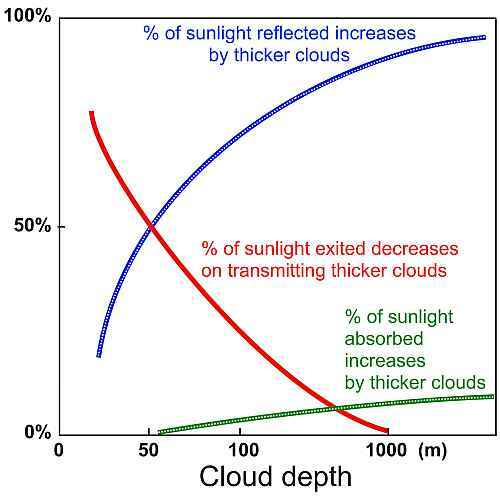 The intensity of direct sunlight is various depends of the cloud thickness. 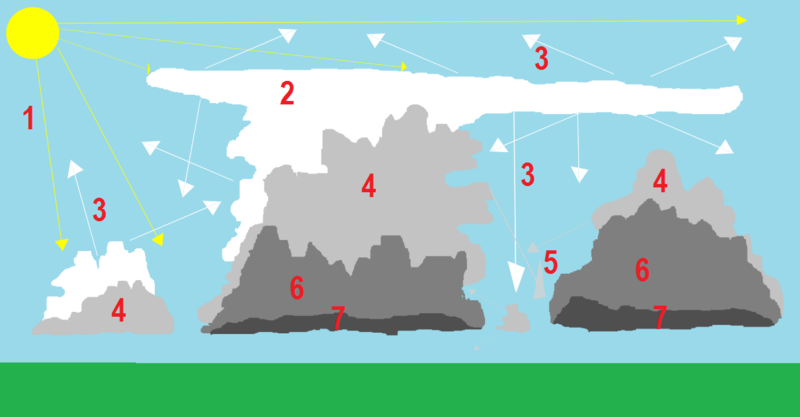 It ranges from 1/6 for relatively thin clouds down to 1/1000 under the extreme thick storm clouds (Pic. 17). Pic. 17 The intensity of direct sunlight is various depends of the cloud thickness. Odrzykoń, Poland. Pic. 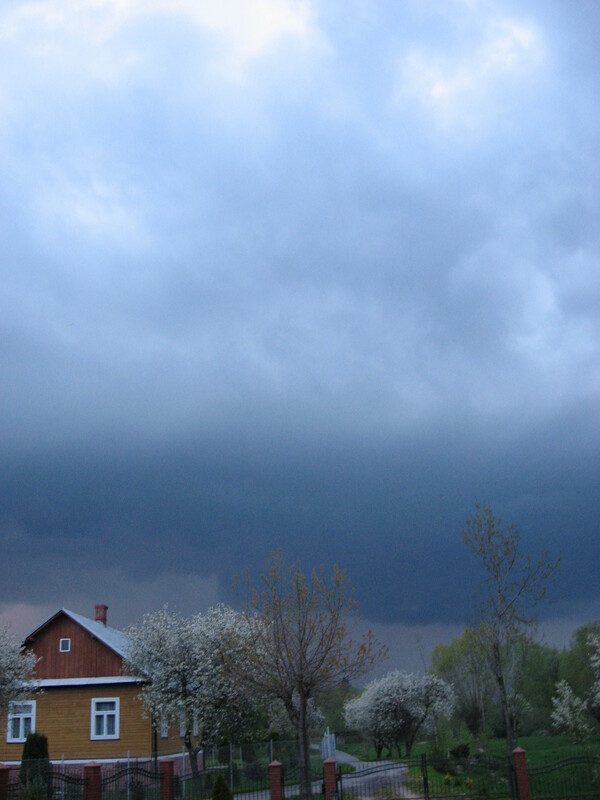 18 An example of multicellular thunderstorm, where young cumulonimbus with dark base is growing under older capillatus, making sky in grey appearance. The cumulonimbus elements, that could look white in solar beams appears to look much darker, because low portion of light goes trough them. Often the clouds cover the sky partially only. There are different sky radiation circumstances. Clear section of sky will still scatter the light in Rayleigh conditions whereas the cloudy sections radiation is different. Clouds can bounce a lot of light around. It is noticeable especially in case of vertical-developed clouds. These clouds are big puffy white objects, that reflect the sunlight effectively making a sky around them look brighter (Pic. 10). Brighter are also the shadows produced by another clouds located in the vicinity. This is the answer why clouds are grey. 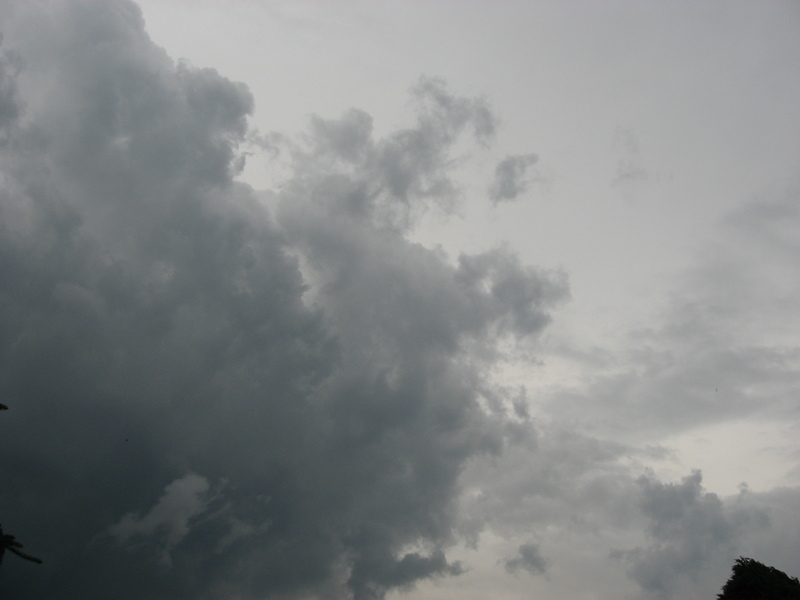 Sometimes we can see a grey clouds shaded by another white cloud floating on higher level. Then less light is scattered, therefore cloud appears to be grey. Similar or even more noticeable effect we can see when a cloud grows thicker. Then more sunlight is reflected from it and less light can penetrate through it (Pic. 17-20). Since little sunlight reaches the underside of the cloud, less light is scattered and cloud base appears grey. Moreover (especially in cumulus clouds case) water droplets near cloud base grow larger being in effect more effective absorber and less effective scatterer more sunlight is either reflected or absorbed before reaching the cloud base. For observer on the ground below cloud base can look dark grey before rain begins to fall. Pic. 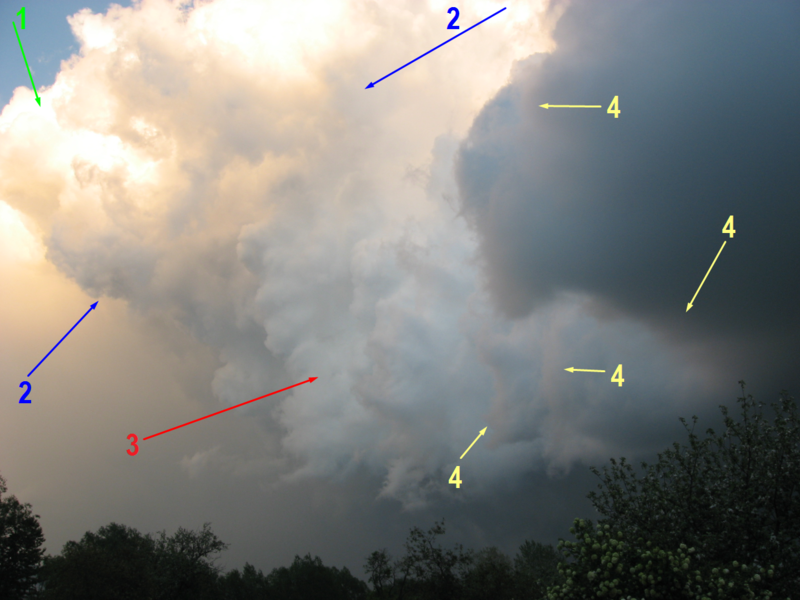 19 The light scattering mechanism in multicellular thunderstorm cloud, where: 1 – direct solar beam, 2 – white appearance of the external parts of the sunlit clouds , 3 – light firstly scattered by cloud surface headed sunwards, 4 – grey appearance of the clouds, shaded by another clouds, 5 – light secondly scattered by shaded clouds or their parts, 6 – light portion penetrating the cloud, 7 – the smallest light portion, that penetrates to cloud base, making it the most darker. Look also on the edges of these clouds, that are to be seen brighter than the middle due to brightesh shadows produced by another clouds in the vicinity. Pic. 20 Cumulonimbus cloud reflecting the light scattered by cloud’s top down to the darkest base. Odrzykoń, Poland. The spectral character of the radiation emanating from the bottom of the cloud also depends on the spectral character of the radiation iluminating the cloud, both at the bottom from the irradiance of the ground and the top from the direct attenuated solar radiation and the Rayleigh scattered skylight. Its intensity and spectral character therefore will depend on the surface albedo, the cloud thickness and type and the solar zenith angle. In the low light conditions like moonlight or twilight the mechanism remains the same. the clouds are the brightest when haded towards the incident light and the darkest beyond (Pic. 21). Pic. 21 Cumulus clouds seen in twilight conditions with the brightest parts headed toward twilight glow and dark base. Odrzykoń, Poland. White light is a mix of wavelengths. We can see the interaction of light both with the surface and the medium, which is our atmosphere. Obviously the Earth’s atmosphere consist with a few layers, separate mediums with different density. We are focusing mainly on the lower layer – troposphere. When the light ray hit the surface we have a reflection of this ray of light. 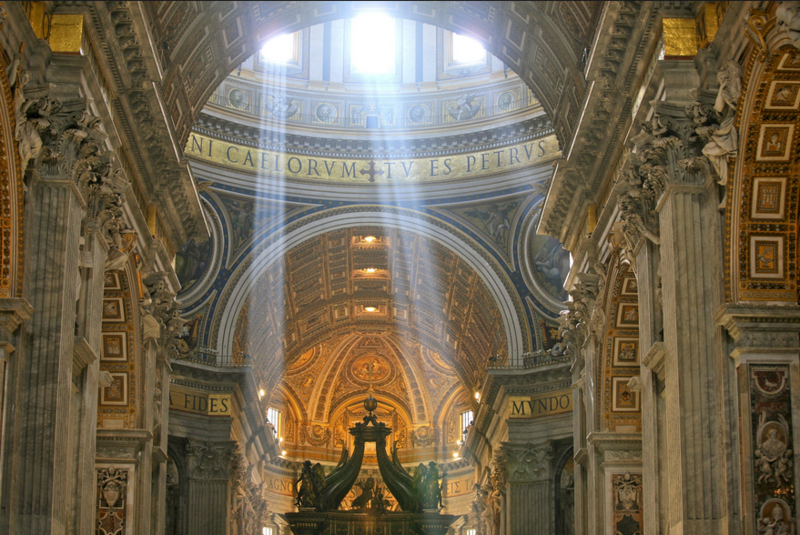 As we know most of surfaces is coarse, what causes the scattering this simple ray of light. At the outcome this ray of light is reverberated in few different directions. Moreover the colour of surface can decide (in case of white light) or modify the color of scattered light. Pic. 22 The interaction of white light with surface. Considerating a white light (the easiest example) in interaction with the surface can produce an optical effects as follows: a) specular reflection, b) lustrous reflection by paper with a sloghly rough surface, c) diffuse reflection from whitewashed wall, where no absorption d) diffuse reflection with absorption of the shorter wavelengths at a painted yellow wall (Flammer et all., 2013). The situation is straightforward for sunlight, that appears to be white. When reflected from for instance orange surface give us orange light scattering, etc (Pic. 20). The surface colour depends on the chamical elements, which is built-up. These chemical elements run the process where light meets an electron it is “shaken” at the frequency of the light. As the result the electron sends out light with the same frequency in any direction. Thus light scattering takes place (Flammer et all, 2013). According to quantum theory: when atom absorbs an UV photon or a photon of visible light, the energy of that photon can excite one of the atom’s electron to a higher energy level. This moment is known as transition. In order for a transition to occur, the energy of the photon absorbed must be greater than or equal to the difference in energy between the 2 energy levels. Once the electron is in the excited, higher energy level, it is in more unstable position than it was when it was in its relaxed, ground state. As such the electron will quickly fall back down to the lower energy level and it doing so, it emits a photon with an energy equal to the difference in energy levels. The simplified scheme of the transition process we can see in previous article. Pic. 23 Each object is built in different chemical element, that incurs an individual transition process. Finally we can see the surfaces in different colours. 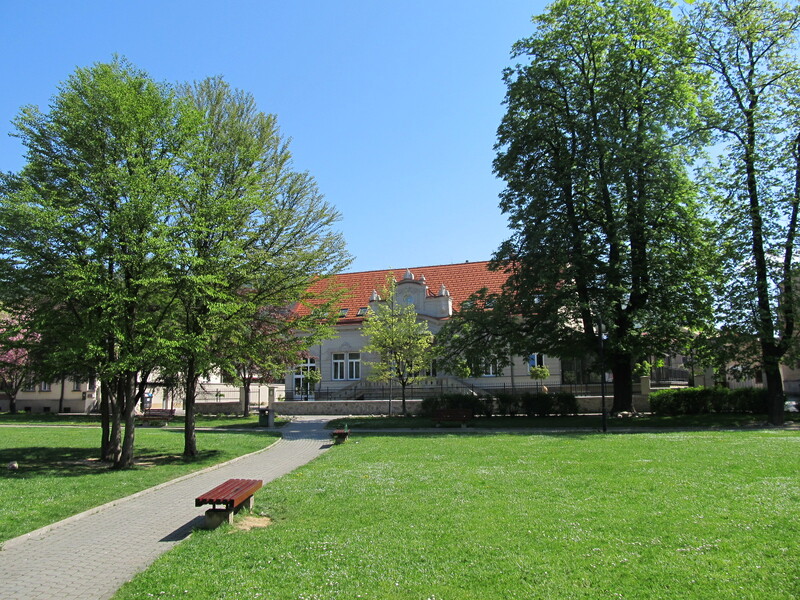 Zilina, Slovakia. There is at least few optical effects related to light scattering. I will not describe all of them perfectly today, because I am going to prepare a separate article about it. Cloud presence can produce a phenomena related with light scattering. First of all when clouds are close to the Sun or Moon can produce the diffraction phenomenon, which is iridescence for clouds built by small water droplets and halo for clouds built by small ice crystals. Then we can see e.g halo phenomena. Pic. 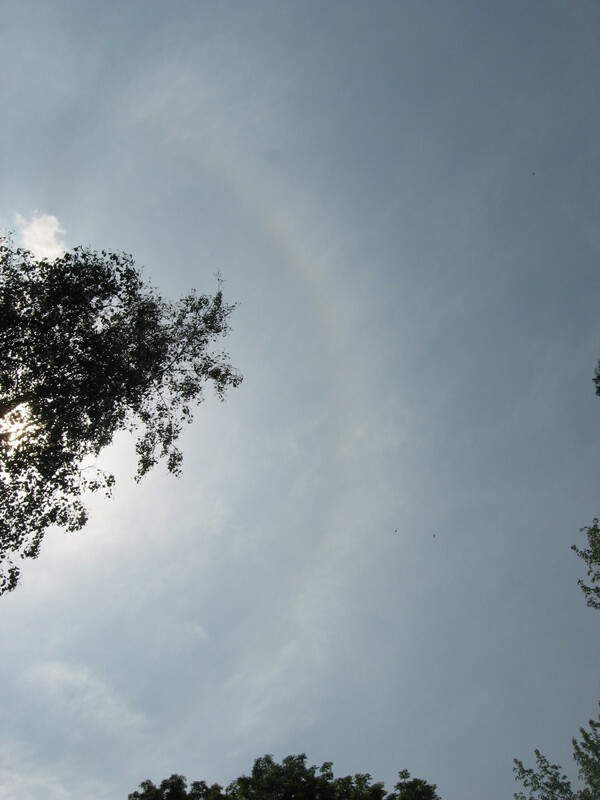 24 The halo phenomenon caused by cirrostratus clouds. Pic. 25 Circumhorizontal arc (wikimedia.org). Common is also the corona phenomenon when cloud is built by small water droplets (Pic. 26). Pic. 26 Lunar corona (wikimedia.org). These phenomenas are effect of the spectral dependence of the angular distribution of scattered light. The intense scattering, that occurs in clouds can quickly extinguish any beam and create in its place a very diffuse radiation flux. I have described this process previously. Because clouds includes the water droplets bigger than light wavelength they can reflect the light from the illumination source depends on its colour. When for example white midday sunlight strikes a cloud, white light is scattered and reflected (Pic.11, 12, 15). This is why clouds are white (with some shades of grey mixed in if the cloud is thick. 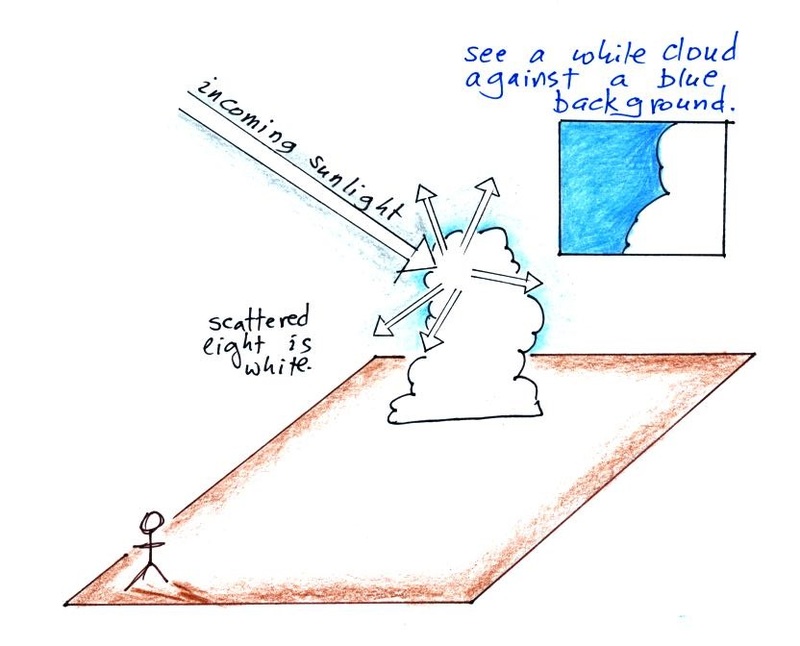 In this case when you look up at a cloud you see a white cloud (sunlight being scattered by cloud droplets) surrounded by blue sky (sunlight being scattered by air molecules). Pic. 27 Clouds throughout the day has a white or greyscale appearance due to almost white sunlight scattering and reflecting. Odrzykoń, Poland. the evening we will face similar situation with reddish light described above. As twilight progress the color of clouds, depend on altitude level and location on the sky will change as per the picture below (Pic. 28). This is because Earth (both with atmosphere) is spherical. Thus is very easy to distinguish the cloud layers near sunrise or sunset conditions. Pic. 28 Color of clouds around sunrise/sunset and during the twilight is dependant on altitude level and position on the sky (angular distance from the solar point) (weather.gov). Pic. 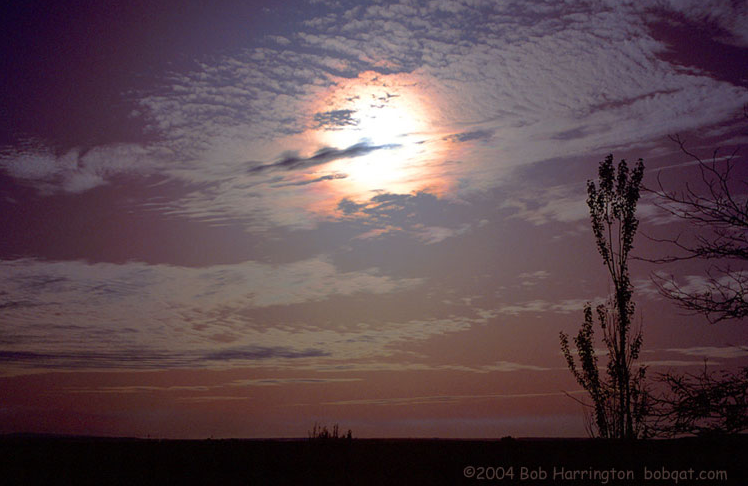 30 Morning or evening clouds reflects a long light wavelengths from the Sun (reddish and orange). Shaded parts remains in greyscale, sometimes slightly mixed with direct sunlight color. Szczawnica, Poland. Sometimes under the overcast sky, when clouds are not thick enough we can notice the sunrise or sunset moment as clouds are turning to yellowish. Pic. 31 When we see only 1 layer of cloud at the sunrise or sunset the important role plays an angular distance from solar position. See the cirrus clouds just before sunrise, when Sun is around 2 deg below the horizon clouds are yellow near the solar point and become more orange when closer to zenith point. Zręcin, Poland. Behind the cloud-level terminator line only scattered light affect on the cloud colour, which is mainly grey-reddish (Pic. 32, 33). Clouds being located beyond the terminator will reflect light scattered from sunlit clouds, reflecting a long light wavelengths. I will describe about it more in the future. Pic. 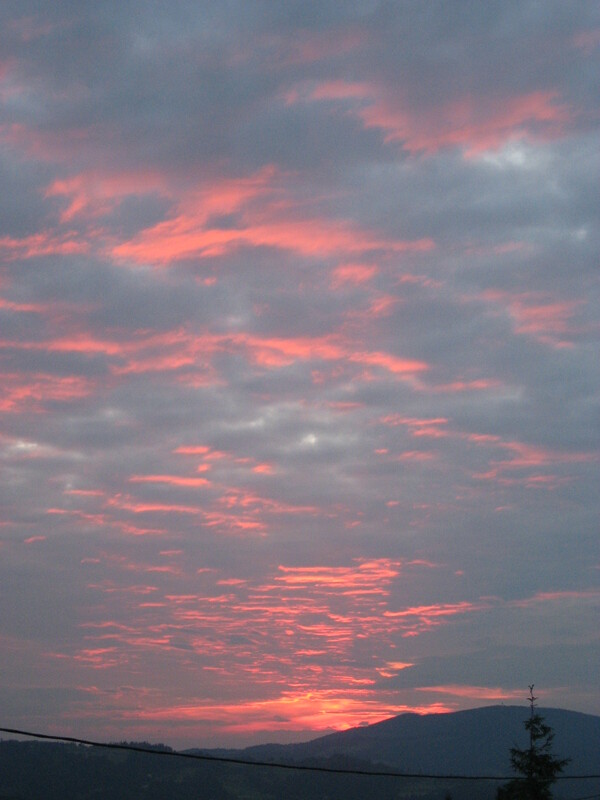 32 The clouds after sunset appearance (weather.gov.hk). Pic. 33 Cirrus clouds, when Sun around 8 deg below the horizon. You can spot, that some of them appears to look reddish due to reflection of red light scattered by another clouds far far away from observer. Zręcin, Poland. Looking on the clouds a the sky we can spot only grey color there. Another situation can occur, when watching the mountain shadow. Clouds outside the shadow are sunlit, whereas clouds inside the shadow reflect only the light scattered in the atmosphere, which gives them grey-bluish appearance (Pic. 34). Pic. 34 The Pico del Teide shadow seen near the Teide Observatory. Yellow arrows shows the solar direct beam, that make clouds yellowish appearance. Each cloud shows, that solar point is located behind the observer. 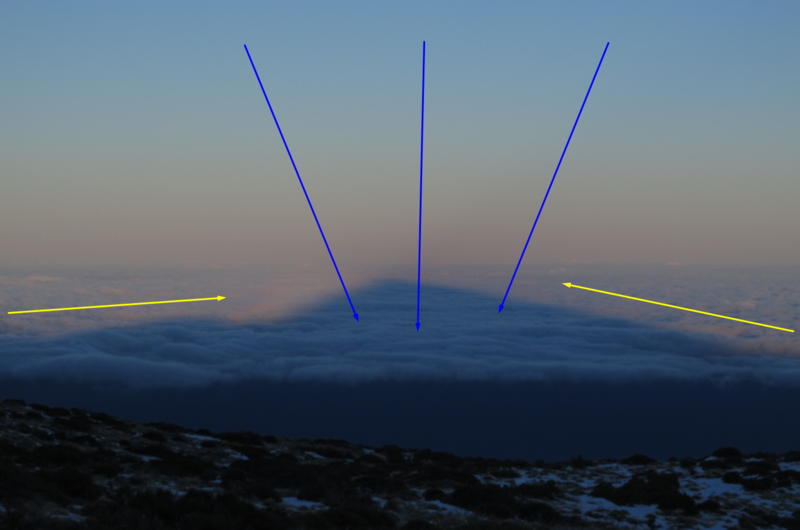 Blue arrows indicate the clouds being in the shadow, whereas only light scattered in the atmsophere is reflected. Unlike to illuminated clouds these clouds are the brightest on the top, because basically from the top light hit them. Moreover these clouds looks grey-bluish reflecting Rayleigh-scattered light in the atmosphere. Tenerife, Spain. The situation is completely different during the nighttime conditions in light polluted areas. 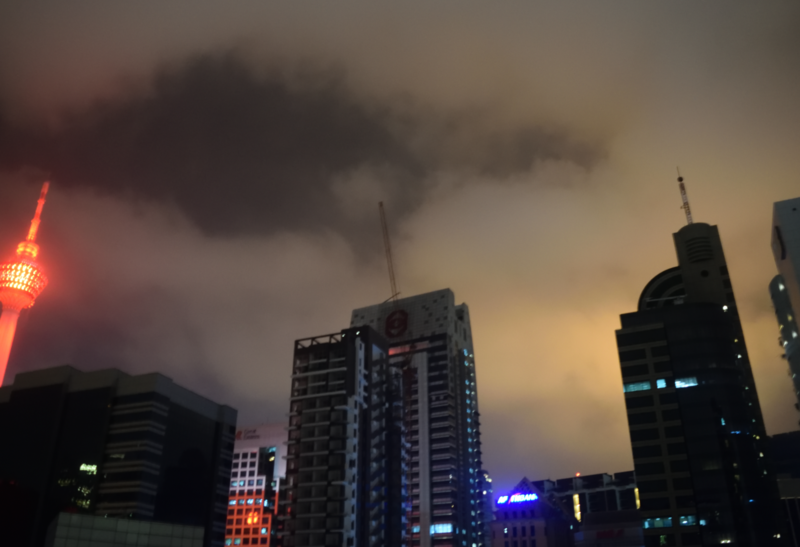 During the night in light polluted areas clouds reflect a yellowish artifical light originated from street lamps. The phenomena is more obvious when cloud is lower or denser. Pic. 35 Illuminated clouds above light polluted area during the night. Kuala Lumpur, Malysia. 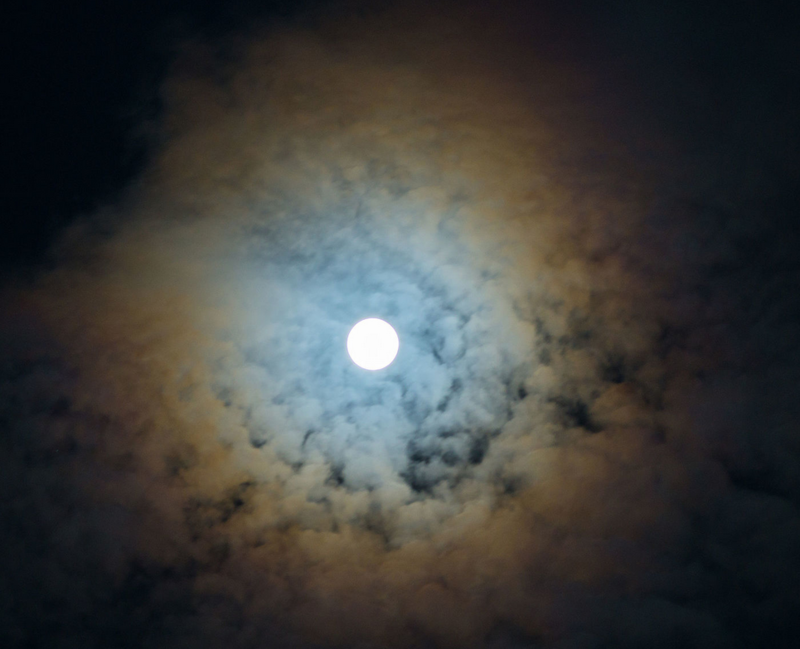 Upper parts of cloud or clouds floated on higher level appear to be dark grey or black, without any light features unless different conditions occur (moonlight or deep twilight), that I will describe in the future. Another situation is when even thin cloud looks grey rather than white. We can explain it perception of our eyes. A light gray cloud on a bright white background will look much darker than the same cloud on a dark or black background, in which case it might look white and bright (Pic. 36). 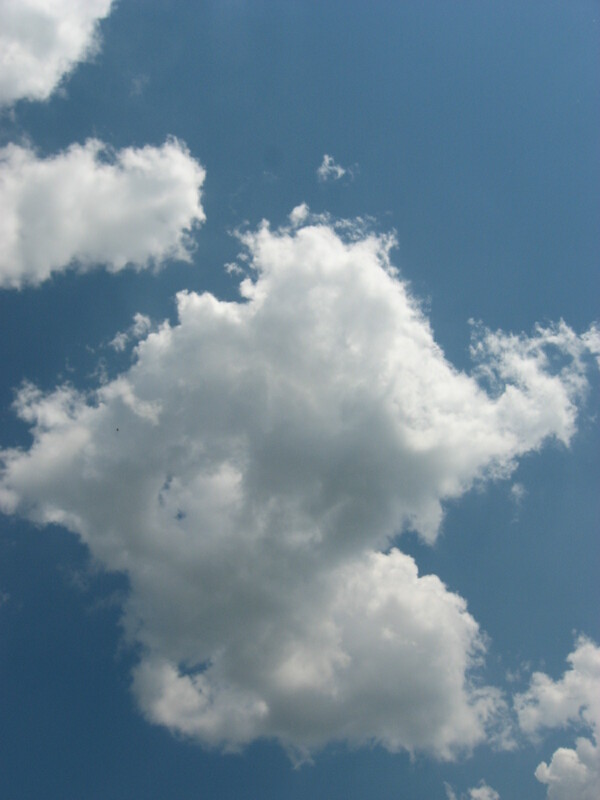 In the other hand a cloud can look dark or gray because it is partially transparent and the blue sky behind it can be seen through the cloud. This will happen in light wispy clouds with little water content and more often in ice crystals clouds. Then halos and sundogs can be visible. Pic. 36 Thin wisp of clouds are often seen darker than sky near the horizon, which is caused by human eye perception. 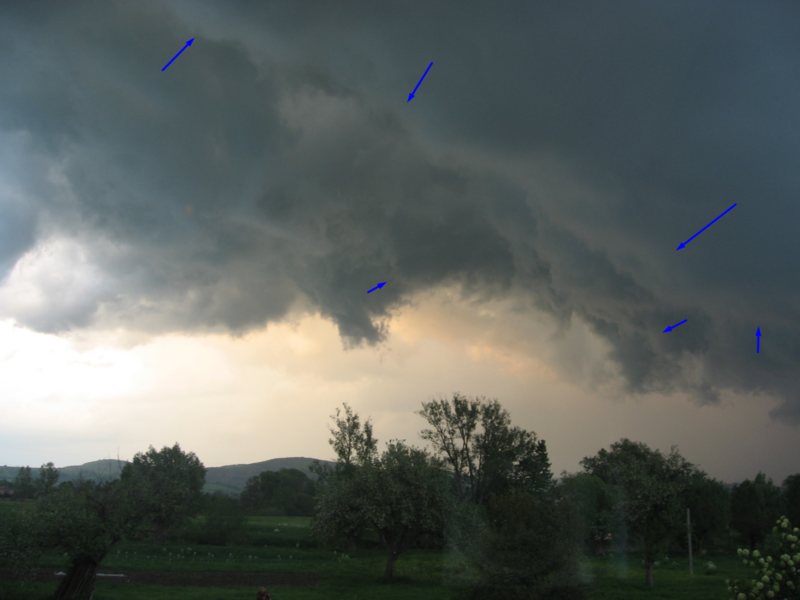 On the right is the same picture with polarized filter, which roughly explains this phenomenon (wikiwand.com). In thunderstorm cases (shelf cloud) when cloud is much thicker and cloud base on much lower altitude observer can spot the light reflection from the adjacent ground being still illuminated by skylight or light scattered by neighbouring tiny clouds (green clouds) (Pic. 37, 38). Basically quite often during thunderstorms before start raining a light from another cloud is reflected (Pic. 37, 39 – 42). Pic. 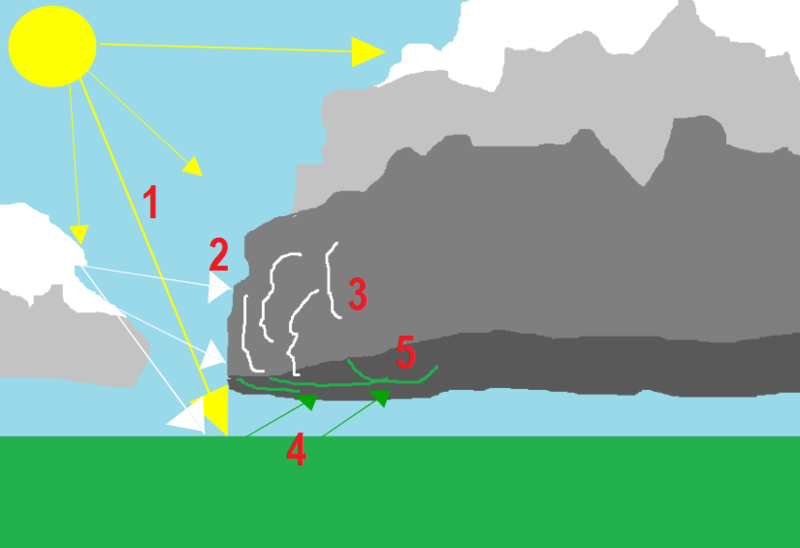 37 The green cloud effect mechanism shown with cloud light reflection process: 1 – direct solar beam, 2 – light scattered and reflected by puffy cumulus or cumulonimbus cloud, 3 – light secondly reflected by another cloud, 4 – light reflected from the ground both from the sun and from the cloud. 5 – green cloud appearance at the bottom of the cumulonimbus cloud. Pic. 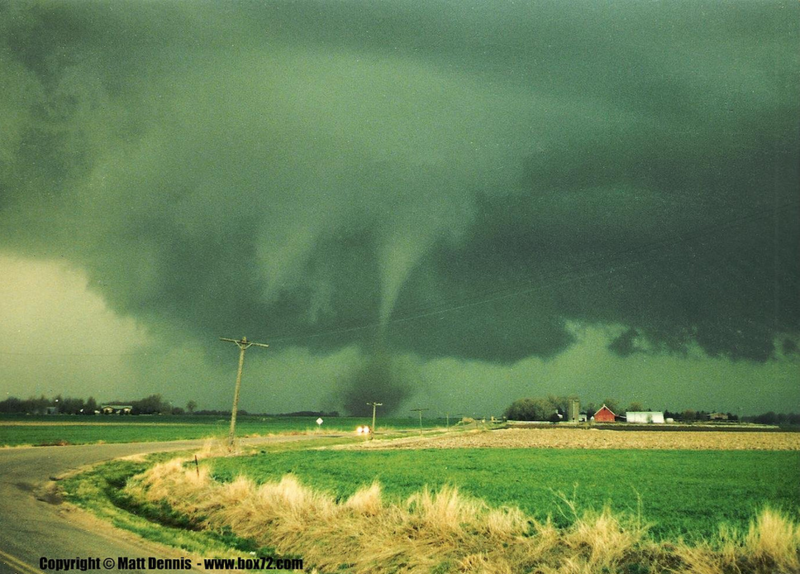 38 Often the green clouds effect is identified with forthcoming tornado, although in general refers to extremely low suspended shelf cloud, which is able to reflect a light from the ground. 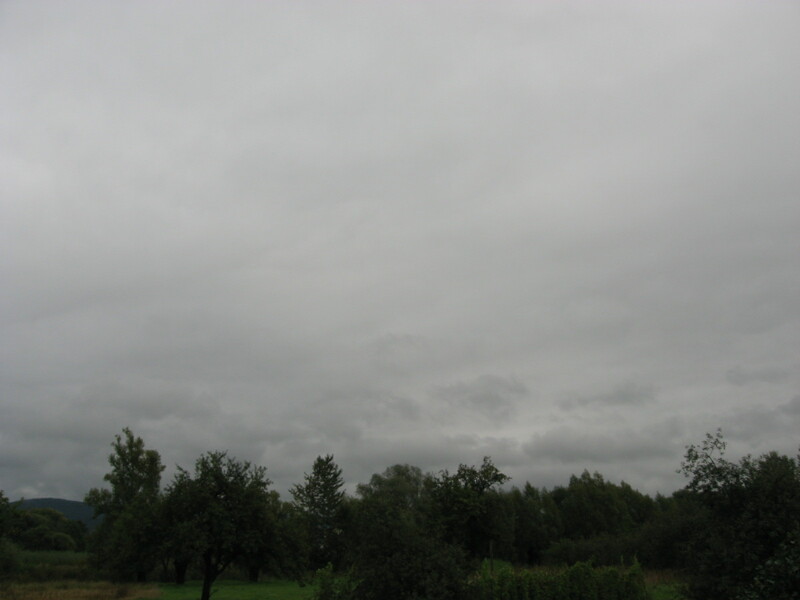 This green is not perfect as seen on grass, but clouds are slightly greenish in its greyscale. 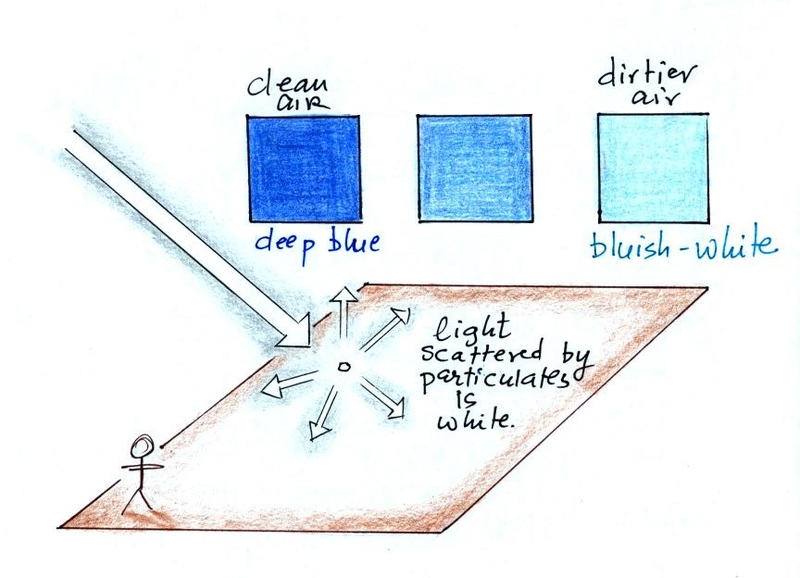 Adequately to the conditions we can observe a blue cloud (above sea) or yellow cloud (above desert) effect depends on the surface (Matt Denis, box72.com). Pic. 39, 40 An example of light reflection before or after thunderstorm outside the precipitation area, where: 1 – direct sunlight reflection and scattering, 2 – scattered sunlight reflection. 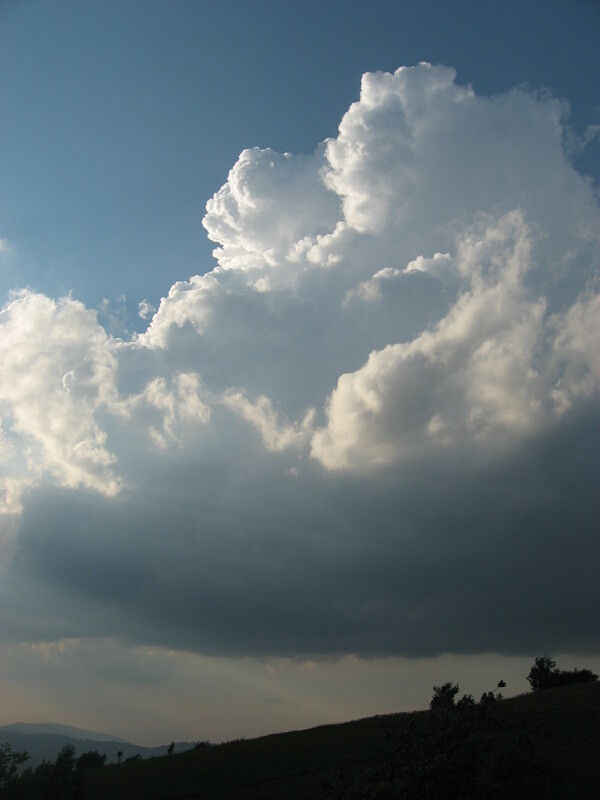 In human eye perspective this part of cloud looks even darker than indicated in point 3, because this shaded portion of cumulonimbus cloud is drown by much brighter portion from point 1, 3 – scattered sunlight reflection, 4 – secondary scattered light, coming from another cloud or part the cloud being in the vicinity (yellowish edges). Pic. 41, 42 Another example of secondary scattered light coming from different cloud, group of clouds or the atmosphere. 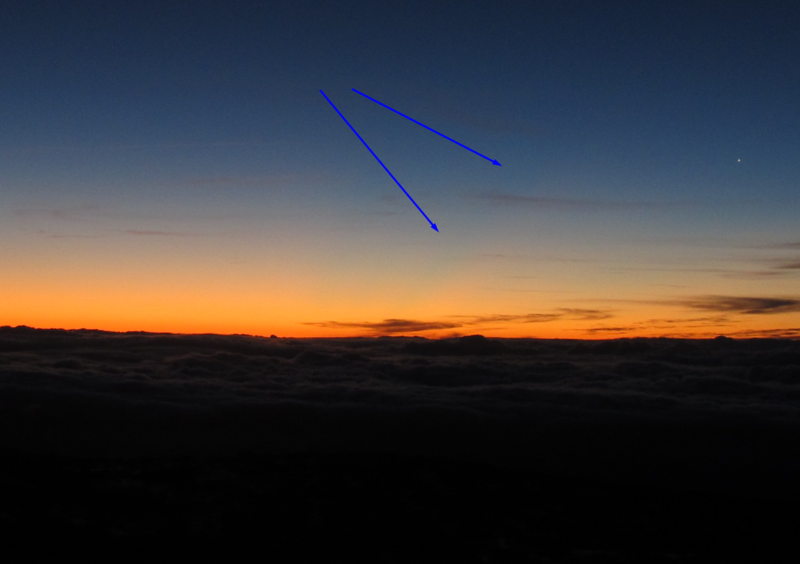 Blue arrows shows discernable brighter cloud edges, which reflects the scattered light coming from the brighter section of the sky seen on the left. Haze is represented by large aerosols with size similar to light wavelength so it not scatter a blue color preferentially like small molecules do. Hazy conditions in the atmosphere are correspond to Mie scattering. The atmosphere is not clear enough to give a perfect blue sky and clear horizon but is more transparent than cloudy or foggy medium. 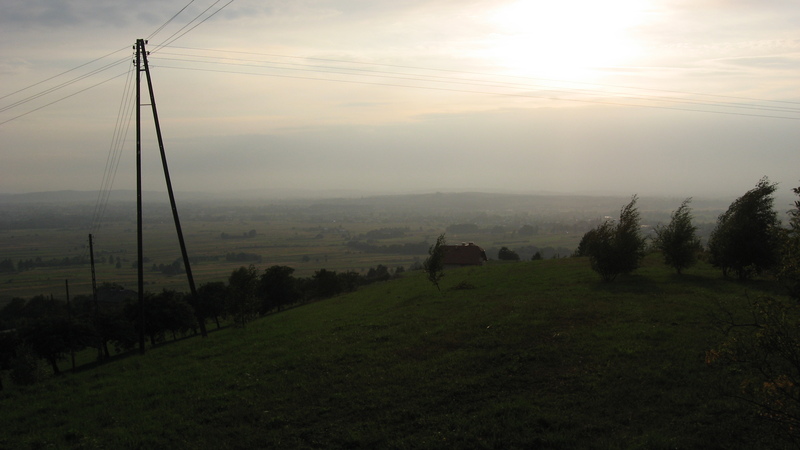 Mainly Mie scattering is typical for the lowest part of the troposphere – atmospheric boundary layer, where the concentration of haze is the biggest. Everywhere above – in “free atmosphere” zone the haze density is low and the effects are somewhere between Rayleigh and Mie scattering. The haze phenomena will be described in the following article, however here I will list all atmospheric optic phenomenas related to hazy conditions. Firstly I would like to say a bit about macroscale phenomenas created by haze presence in the atmosphere. 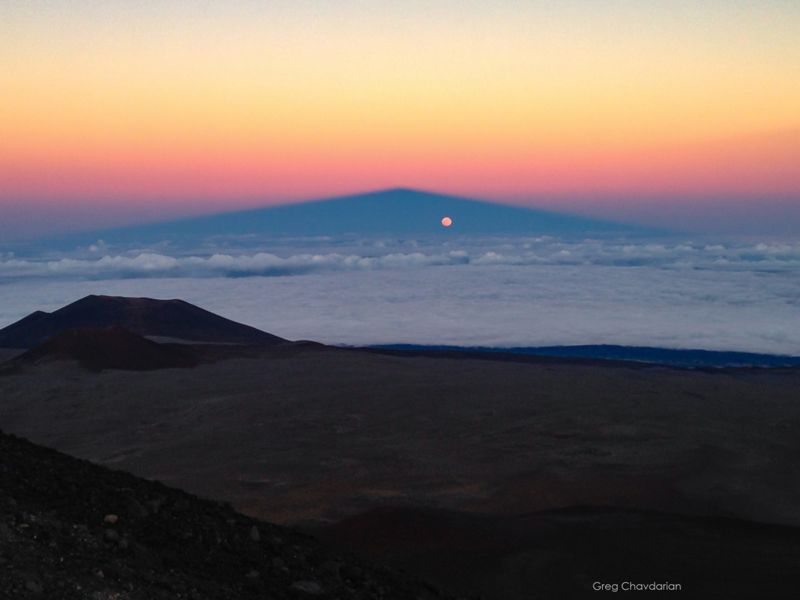 They’re crepuscular rays, anticrepuscular rays, dawn’s warm glow (solar and antisolar rays) and mountain shadow. These atmospheric optics are similar to each other and often visible in more or less hazy conditions. Both crepuscular rays and dawn’s warm glow are rays of sunlight, that appear to radiate from the point of the sky, where Sun is located. The difference between crepuscular rays and dawn’s warm glow is the period of daytime, when they are to be observed. Crepuscular rays can be seen throughout the day, whereas a dawn’s warm glow, are to be seen around sunrise and sunset only. The dawn’s warm glow is the kind of both crepuscular and anticrepuscular rays. Anticrepuscular rays are to be seen when looking towards antisolar direction. All these atmospheric optics are produced by presence of clouds. Mainly there are a cumulus, stratocumulus or cumulonimbus clouds, with sharp borders. The solar rays streams through the cloud gaps and appear as a columns of sunlit air separated by darker cloud-shadows region (Pic. 43). These rays are in fact near parallel shafts of sunlight. Pic. 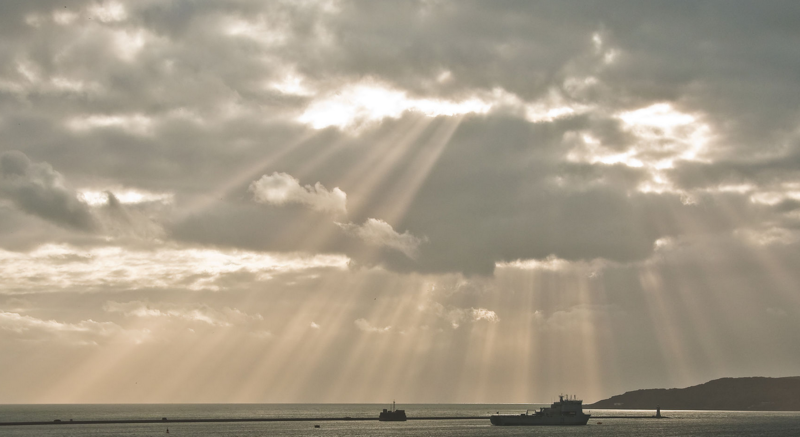 43 Crepuscular rays produced by stratocumulus clouds above Southampton coast (wikimedia.org). 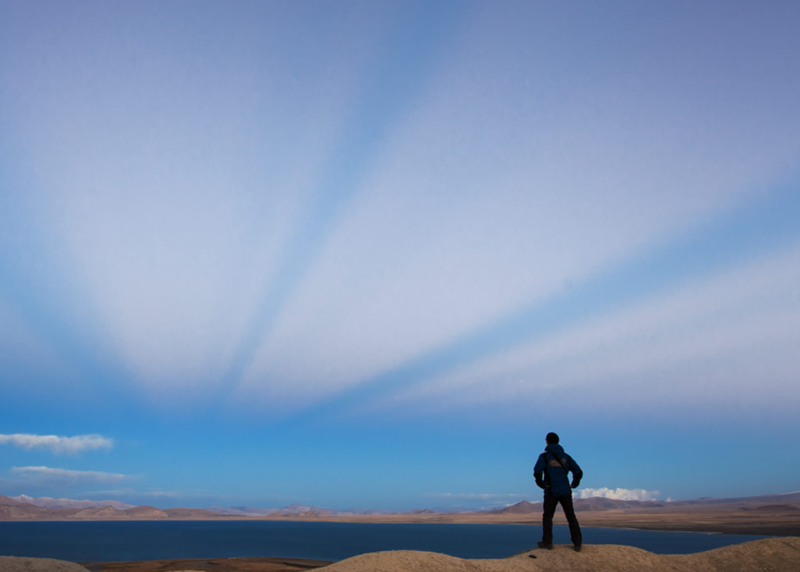 Anticrepuscular rays are more frequently visible around sunrise and sunset. 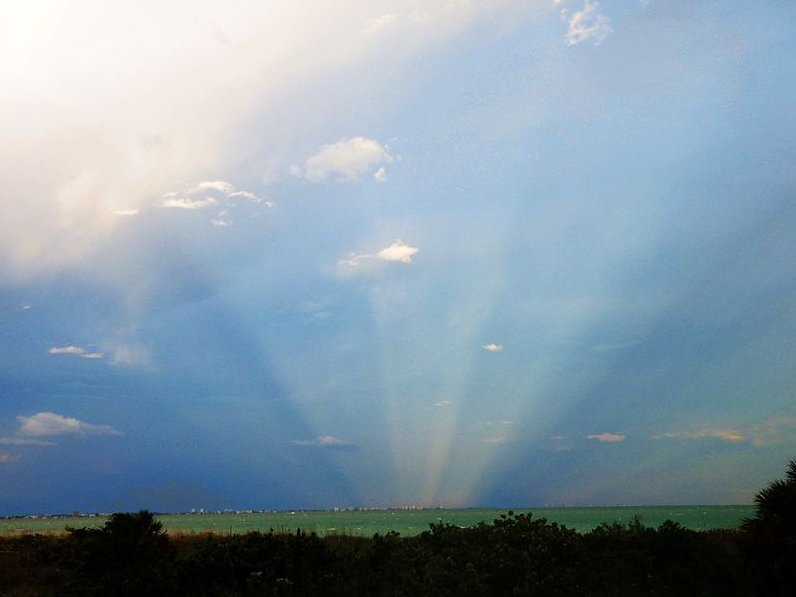 Anticrepuscular rays are also near paralell, but apears to converge in antisolar point (Pic. 44). This convergence is actually an optical illusion, because their apparent convergence is toward a vanishing point, which is an infinite distance away from the viewer. Pic. 44 Anticrepuscular rays (wikimedia.org). Both crepuscular and antirepuscular rays are similar to dawn’s warm glow, which is often called as a solar or antisolar rays. This kind of rays occurs when Sun is about to rise/set and mainly during the civil twilight. These rays are mainly produced in “free atmosphere” where aerosols concentration is low, thus hey are not dependend on Mie scattering only, because Rayleigh Scattering is also important factor there. 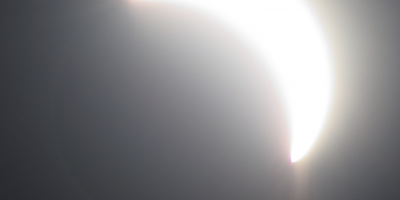 Dawn’s warm glow is visible as a group of extended reddish rays or darker elongated shadows from solar point throughout the sky sphere towards antisolar point or civil wedge. Basically the dawn’s warm glow can be visible from deep nautical twilight when conditions are favourable (e.g at the top of high mountains) (Pic. 45). Pic. 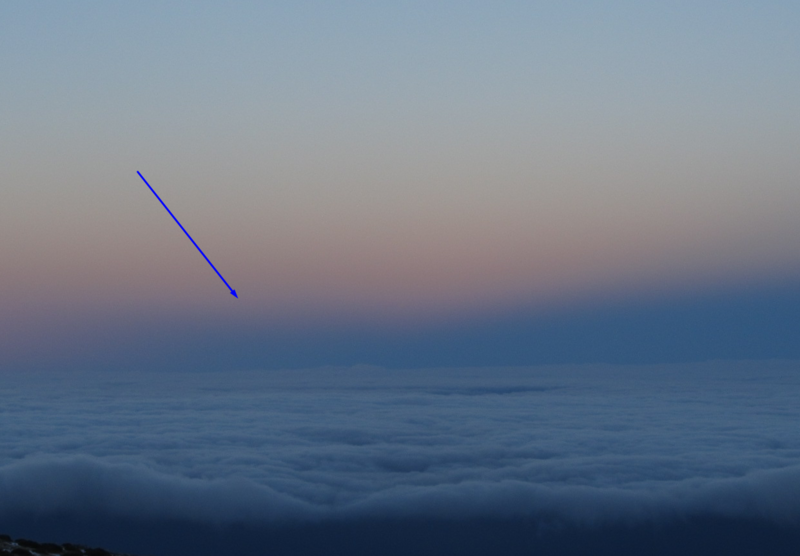 45 Dawn’s warm glow (solar rays) seen from Tenerife at 2400 m.a.s.l near Teide Observatory, when Sun was 9 degrees below the horizon (middle of nautical dawn). Tenerife, Spain. Pic. 46 Dawn’s warm glow (antisolar rays) can touch the twilight wedge (the Belt of Venus) (Jeff Dai, atoptics.co.uk). Last phenomenon caused by Mie scattering is a mountain shadow. It is produced analogically to dawn’s warm glow, but in this case solar beams are covered by mountain rather than clouds. Likewise in case of solar and antisolar rays Mie scattering is not main factor here, becuase also Rayleigh scattering is important due to “free atmosphere” conditions. This view is typical for area with freestanding high mountains above much lower terrain or sea surface. The mountain shadow is perfectly visible when standing at the top (Pic. 47). However observer can notice it being next to the mountain (Pic. 45, 46). 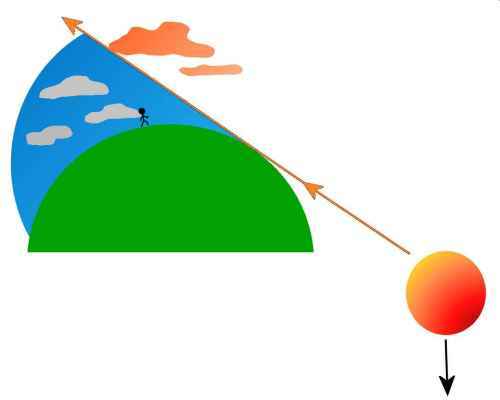 When freestanding mountain is very high (a few km above ground level) then its shadow can even merge with civil wedge (the Belt of Venus) (Pic. 46). Pic. 48, 49 – Pico del Teide mountain shadow seen from the position, when observer is located somewhere next to the mountain (near Teide Observatory). Aside for shadow there are two another things to spot: 1 – gloria seen on clouds, which shows roughly current antisolar point. 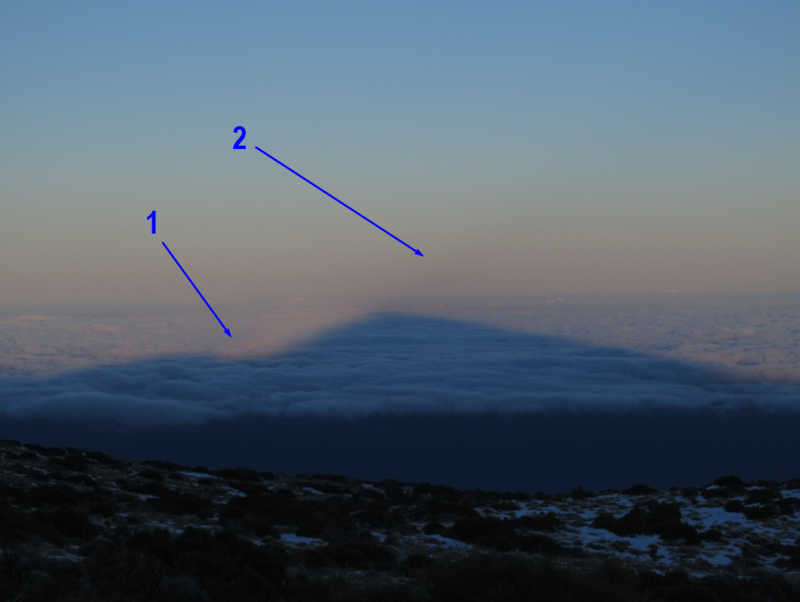 2 – shadow column seen in the air, which becomes more visible as goes closer to the clouds. It is related with increasing thickness of the shadow when closer to its end. Tenerife, Spain. Pic. 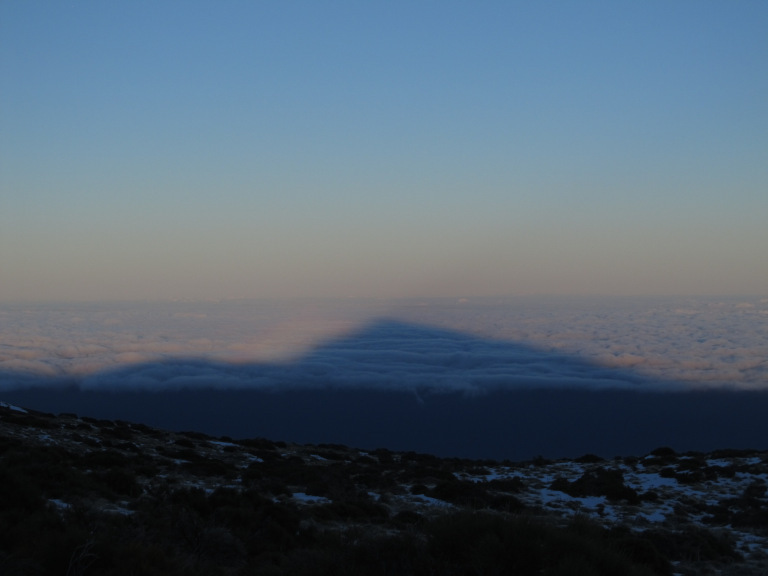 50 The Pico del Teide shadow merging with rising twilight wedge (the Belt of Venus). Tenerife, Spain. Another interesting phenomenas, which occur mainly in the lowest part of the troposphere are: aerial perspective, Bishop’s ring and pollen corona. Aerial perspective is very common phenomena present in the Earth’s atmosphere and refers to every weather conditions ranging from very fair days with near-Rayleigh scattering conditions down to foggy weather. Atmosphere behaviour affect on the obiect appearance seen by the observer from the distance. As the distance between object and observer increases, the contrast between the object and background decreases (Pic. 51). More about it I will develop in further writing. Pic. 51 The aerial perspective seen in Bieszczady Mts. Every subsequent range from the observer looks fainter and fainter due to intensive light scattering on haze particles. Wołosate, Bieszczady, Poland. 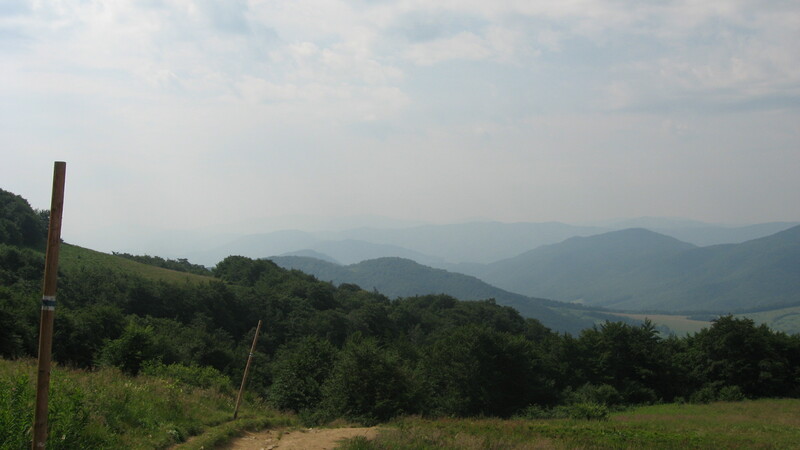 Wołosate, Bieszczady, Poland. Bishop’s ring is produced by the scattering of sunlight by ash and hydrate sulfate droplets. This phenomena is often present after volcanoe eroptions. Pollen corona is caused by high pollen concentration in the lowest part of the atmosphere, when stable high pressure conditions. 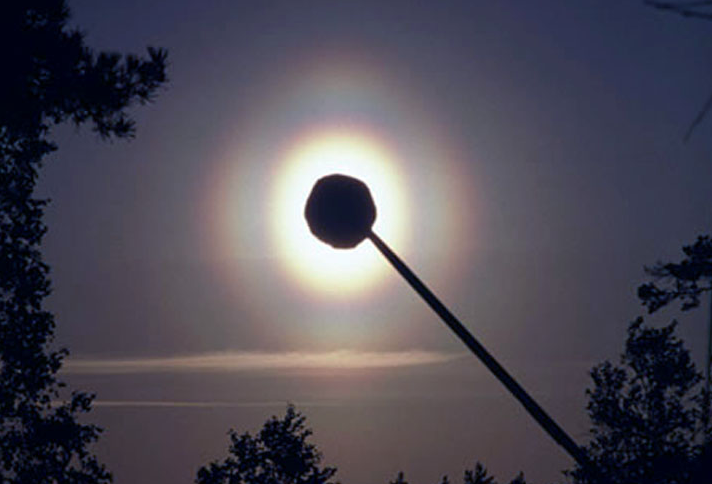 The pollen aerosols are quite big and produce a small coronae around Sun or Moon (Pic. 53). Pic. 52 The Bishop’s ring phenomena (Bob Harrington, bobgat.com, atoptics.co.uk). At the finish is worth to mention about morning/evening sky colour affected by haze concentration. As I shown in previous article the colour of zenith sky varies throughout the day. The sky colour near sunrise / sunset depends on the haze concentration likewise throughout the day (Pic. 5). As haze presence increases sky looks more reddish, because more long wavelengths are scattered on aerosols particles. Nevertheles even in the worst case scenario main colour of evening zenith sky remains blue (Pic. 54). Pic. 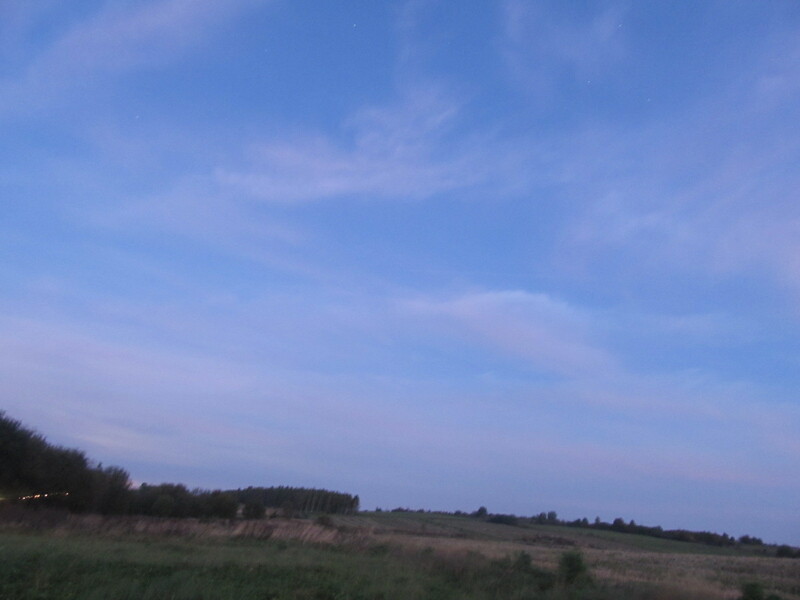 54 Evening zenith sky is blue with some greenish, orange and reddish tint, which appears to be more significant, when haze concentration is bigger (on the right). Ahrens C.D., 2003, Meteorology Today: An Introduction to Weather, Climate, and the Environment, vol. 1, Nature, London. Kassinov E., et all, 2011, Shortwave spectral radiative forcing of cumulus clouds from surface observations (in:) Geophysical Research Letters, vol. 38. Van de Hulst H. C., 1957, Light scattering by small particles, Dover Publications Inc., New York. Mie plot – Mie scattering computer simulation. Why does the sky turn green before tornado?